X Factory announces the X – 60CF, a great new 1/10 stadium truck. Building on the success of the amazing carbon fiber SCX – 60CF short course truck, this new stadium truck continues many of the same design principles. It’s an all carbon fiber Conversion Kit that converts a T 4 or 4.1 to a slim new mid-motor monster. 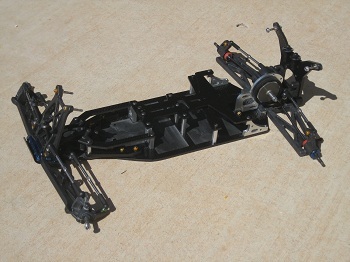 For several years the molded-chassis X – 60 has been very successful on tracks all over the world; now X Factory changes it to a carbon fiber truck that is lighter and moves the weight more to the center of the truck. Lean in the corners is greatly reduced for faster lines, and the latest prototype X – 60CF weighs in at only about 1870 grams fully dressed for racing! The X – 60 provided design inspiration for the SCX – 60CF which has been winning races for the past eight months, and X Factory has carried over those great design principles and many of the same parts to make this daring all-new stadium truck. X-Team drivers will use production prototypes in several major races all over the U.S. during October and drivers are encouraged to come take a look. Chris Cristo will attend this weekend’s JConcepts race at R/C Excitement in Fitchburg, Mass. Chris Gould will have one at the Gold Cup race at Tacoma R/C in Washington the following weekend, and Ryan Durenne will drive an X – 60CF at the Spektrum race in Milwaukee. Final set-up details are being worked out now and X Factory is beginning to write the instruction manual. Expect X – 60CF Conversion Kits in great hobby stores in late November, so save up some Christmas money and let’s go truckin’!! If you like this article, check out this additional article on X Factory.